Getting dinner on the table is as easy as opening your freezer. Yes, the freezer! 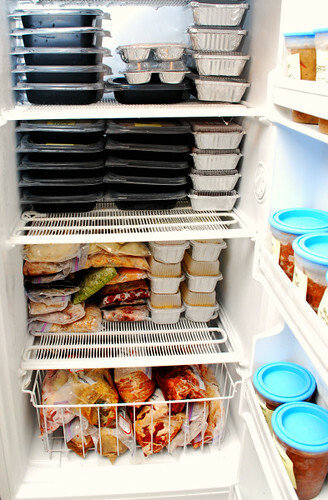 A couple years ago, I stocked my freezer with meals I prepared before my son was born. Since then, I've put aside a weekend a month to prep a few meals in advance and stocked my freezer with containers filled with heat and eat dinners. When the opportunity to work with Foodbuzz and GLAD Freezerware came up, it was right up my alley since I'm already a fan of GLAD storage containers. When I filled my freezer with make ahead meals before my son was born, I used GLAD Ovenware. These are the ideal storage containers for freezer meals that requires to be baked or microwaved. 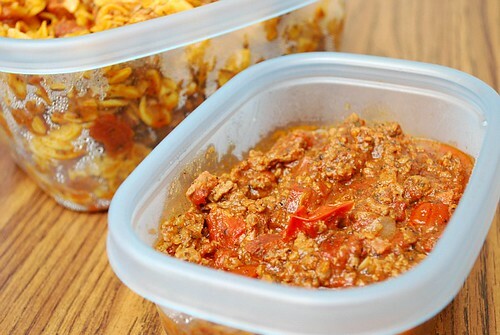 The beauty of these containers is that you can freeze your meals in them and pop them in your oven or microwave. Another thing is that they are dishwasher safe and reuseable! This time around, my friends at GLAD® introduced me to their new storage containers made specifically for the freezer. GLAD® FreezerwareTM is the only freezer container that resists cracking, is formulated to withstand extreme temperatures and allows me to just freeze, heat and serve my meals! Having these freezer friendly containers helped save me time during the weeknights when it seems like I have so many things to do all at one. The convenience of being able to pop these containers in the microwave (which are free of BPAs) to heat up food has helped get dinner on the table. I also like the 2 different sizes (small and large), which allows me to portion out the meals for family dinners and even workday lunches. With a case of GLAD® FreezerwareTM, I had quite a few dishes in mind to prepare for future dinners. 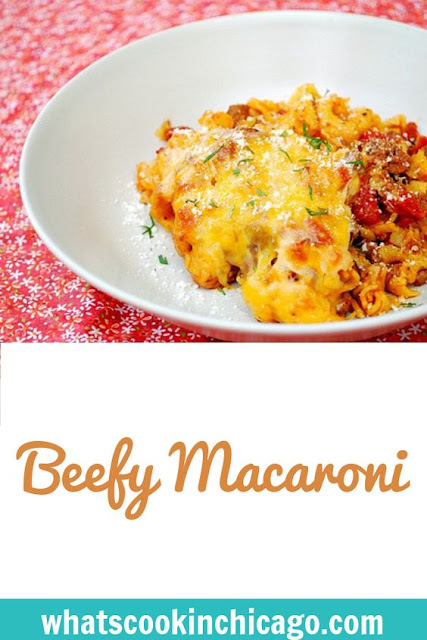 One of our favorites is this Beefy Macaroni. A rich sauce made with ground beef, tomatoes, onions and a blend of spices that's left to slowly simmer and develop its flavors for an hour. 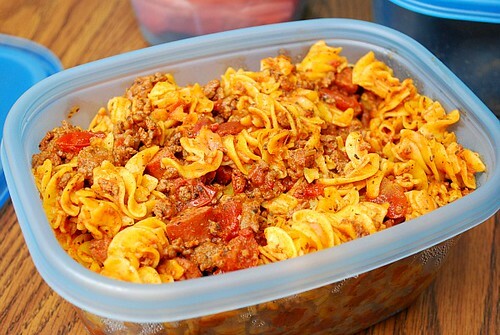 Cooked pasta of your choice is combined with the meaty sauce. You can serve once incorporated or transfer the mixture to an ovenproof dish and bake with a sprinkling of cheese on top before serving. 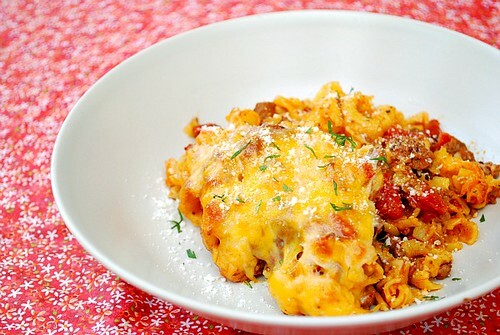 Either way, this is such a comforting dish and it's even toddler approved! You may end up with more sauce than you need... and if that's the case, store the excess in the small GLAD Freezerware. Having portioned out sauce is perfect for using in other recipes or individual portions to mix with pasta. Sweat the onions in the oil with a three-fingered pinch of salt. Add the beef and cook it, breaking it up as you do. Add another pinch of salt or two, along with the spices. Add the tomatoes and bring to a simmer, then reduce the heat to low and cook for an hour. This is extremely important! The low and slow cooking allows for the flavors to blend and meld together. Cook the macaroni or pasta in boiling water until al dente or has a slight bite. Drain it and add it to the simmering sauce. Stir it into the sauce and add more salt and other seasonings as needed, and cover. When it’s cooled and the pasta has absorbed the tomato juices, transfer it to a storage container and allow to cool before freezing/chilling. Otherwise, transfer the Beefy Macaroni to a large baking dish and cover it with foil. Bake it in a 400 degree oven till hot. Remove the foil, cover macaroni with the cheese and broil until browned. As part of the Foodbuzz Tastemaker Program, I received a case of Glad® Freezerware™ containers and a stipend to cover the cost of ingredients purchase for freezer friendly meals. I cook the same way, filling my kitchen with delicious food aromas and then filling my freezer with delicious eats. It is now winter here and having a cast iron dutch oven on the cook top, with delicious ingredients "glubbing" away is double comfort as the aroma is added to by wonderful warmth. Like yours mine is often ground meat with lots of vegetables, and spices and herbs added to suit which ever flavour direction I'm heading in on the day. i tend to prepare pasta/rice/potatoes while I'm reheating a portion. Isn't it a relief to have all that scrummyness lurking in the freezer! Thanks for the beefy macaroni recipe. If you don't mind, can you submit your beefy macaroni photo in http://www.foodporn.net ?